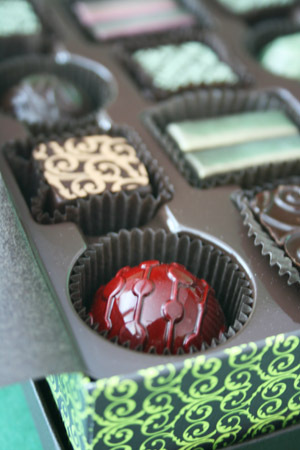 The Coffee Sour Cherry chocolate in the festive box looks like a holiday ornament. It tastes like a holiday, too. Photography by Hannah Kaminsky | THE NIBBLE. 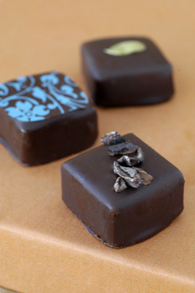 WHAT IT IS: Artisan bonbons. WHY IT’S DIFFERENT: Made from sustainable ingredients in sustainable packaging by the former Executive Pastry Chef of Le Bec Fin restaurant. WHY WE LOVE IT: Beautiful, beautifully packaged, delicious, sustainable. WHERE TO BUY IT: AntoineAmrani.com. CAPSULE REPORT: Say the words “Valley Forge” and most people think of General George Washington and the Continental Army, freezing through the winter of 1777-1778. If only those brave patriots could return and be rewarded at the sweet sanctuary of Antoine Amrani Chocolates in East Norriton, a short march away (and a mere half hour northwest of Philadelphia). A French pastry chef with top credentials and a special passion for chocolate, Amrani was working at Philadelphia’s famed Le Bec Fin restaurant when an opportunity beckoned to branch out and build his own chocolate factory. 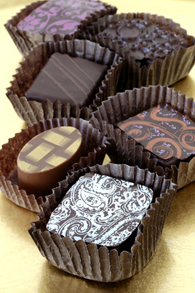 We taste a lot of chocolate every year (and you have no idea what a tough job that is!). Amrani’s bonbons, made with natural and organic ingredients, stand out not just for quality and distinctive flavors, but for their patrician good looks. The pieces are so festive—some look like ornaments, others like jewels, the rest like sumptuous brocades. They’re not just chocolate—they’re eye candy. Looking at them makes you feel like it’s a holiday—and that’s why they’re perfect gifts for the holidays, for upscale Halloween celebrants and for celebrating the great food we have access to, 365 days a year. Amrani is committed to environmental sustainability in both his ingredients and his packaging. Read more about these delicious chocolates in the full review below. Chokola’j Chocolate. Another company dedicated to organic ingredients and sustainability, Chokola’j also is locavore, using ingredients from nearby farmers. Read the review. Theo Chocolate. Theo is the first organic, Fair Trade Certified chocolate made in the U.S. We love the bonbons as well as the bars (especially Bread & Chocolate, Chai and Coconut Curry). Read our review. Lillie Belle Farms. 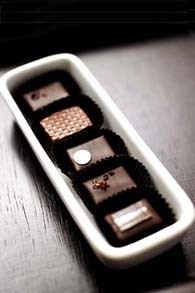 This innovative chocolatier grows his own organic fruits; every time we turn around there’s something new to-die-for. 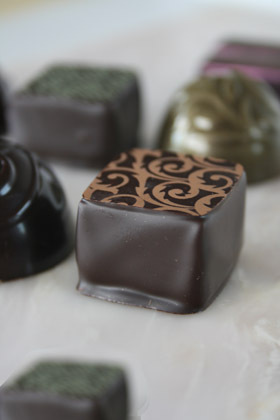 In addition to the bonbons, get a box of lavender caramels. Read the review. This is Page 1 of a three-page article. Click on the black links to visit other pages. Bodacious brats in fab flavors. Antoine Amrani trained at the Ritz Escoffier School in Paris and with master chocolatiers throughout Europe, and perfected his skills during his tenure as Executive Pastry Chef at Philadelphia’s renowned temple of haute cuisine, Le Bec Fin. Amrani takes his classic French training in flavors such as Duo Café, Grand Marnier, Hazelnut Praline, Pistachio and Raspberry, and adds some modern touches—Almond Crisp (almond praline with crisped rice), Banana Rum, Cinnamon Honey, Coconut Kaffir Lime, Coffee Sour Cherry and Earl Grey. They’re all charmers and so festive looking, the party starts the moment you open the box. Amrani Chocolates is not just here to party. The company is committed to the environment and the community as well. It sources ingredients from many local farms, organic growers and smaller family-owned farms from around the world. The lovely boxes are environmentally sensitive: The signature brown paper is FSC certified, carbon neutral and manufactured using Green-e certified wind energy. The paperboard is made with 100% recycled and 90% post-consumer content and contains no harmful chemicals or metals. The Earl Grey Tea palet, ready to party. The chocolates are all-natural and and entirely preservative-free, which means that you have to eat them up within a couple of weeks. But unless someone hides the box, they won’t last that long. Follow us to Page 2 to check out the bonbons in detail.